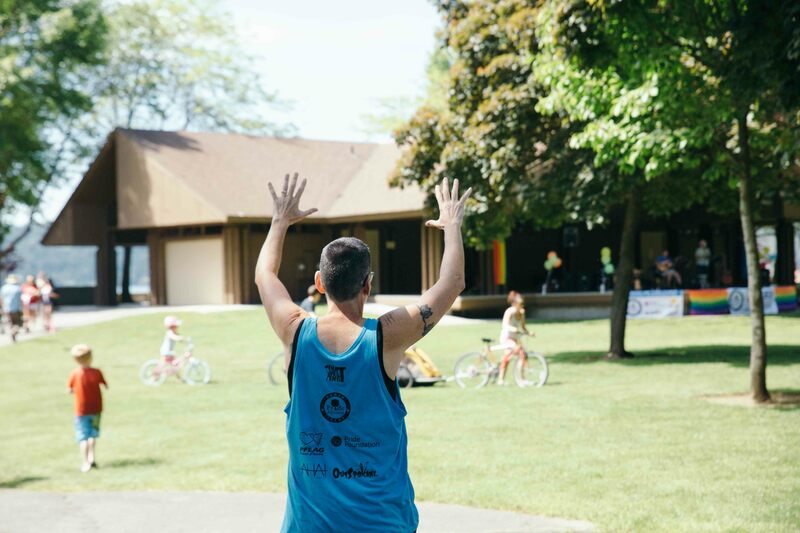 At this year’s 3rd annual Pride in the Park, Kootenai County Democrats joined a rainbow of vibrant organizations, businesses and attendees to celebrate inclusion and diversity. 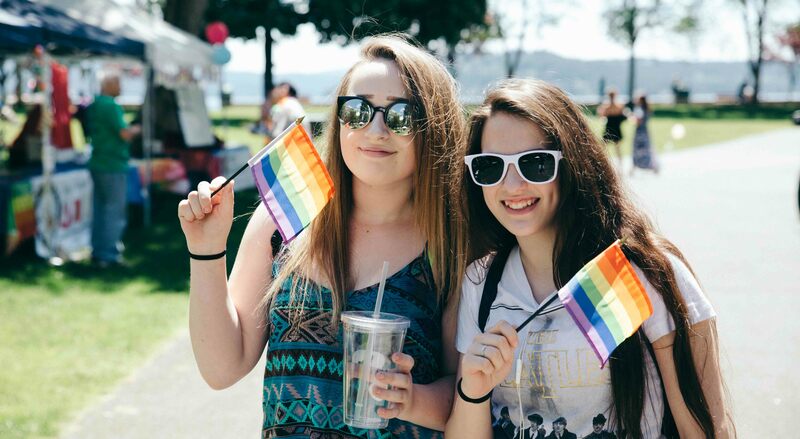 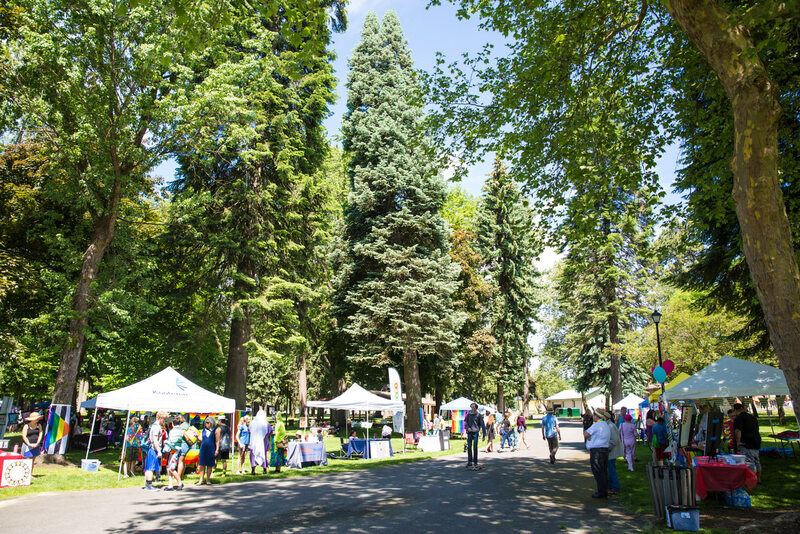 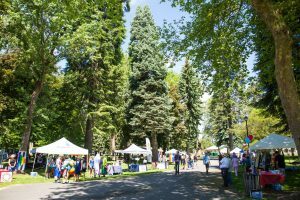 Organized by the North Idaho Pride Alliance, the event was held at Coeur d’Alene City Park on Saturday, June 3rd. 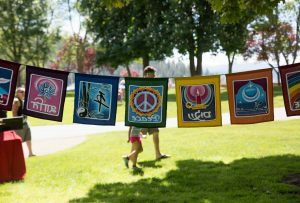 The selected theme “LIVE.LOVE.BE.UNITED!” radiated through the music, sunshine and smiling faces for this eclectic community gathering. The Kootenai County Democrats experimented with a new approach to community outreach through their interactive voter registration booth. Using the power of enthusiasm, volunteers got out from behind the booth and drew passers-by in, promoting the benefits of Vote By Mail and the youth vote. 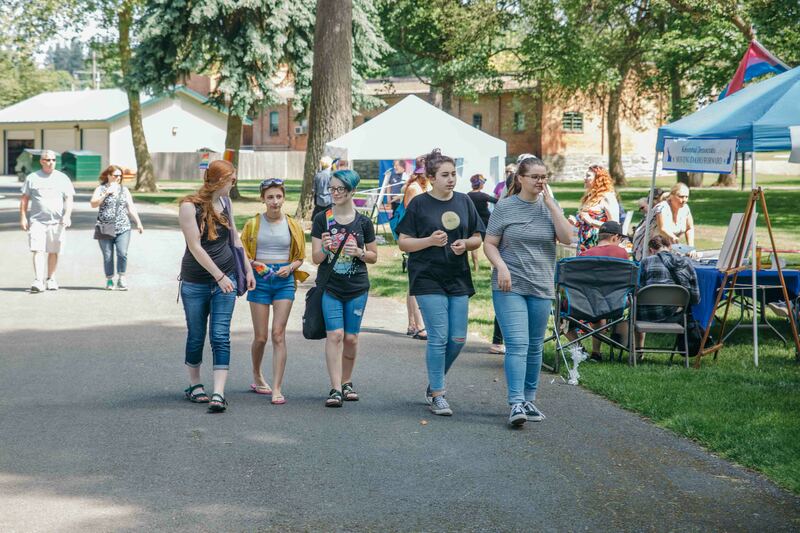 Camping chairs, sidewalk chalk, colorful signage and outgoing personalities helped create a fun, hangout spot where people could ask questions about the voting process and how to get involved. 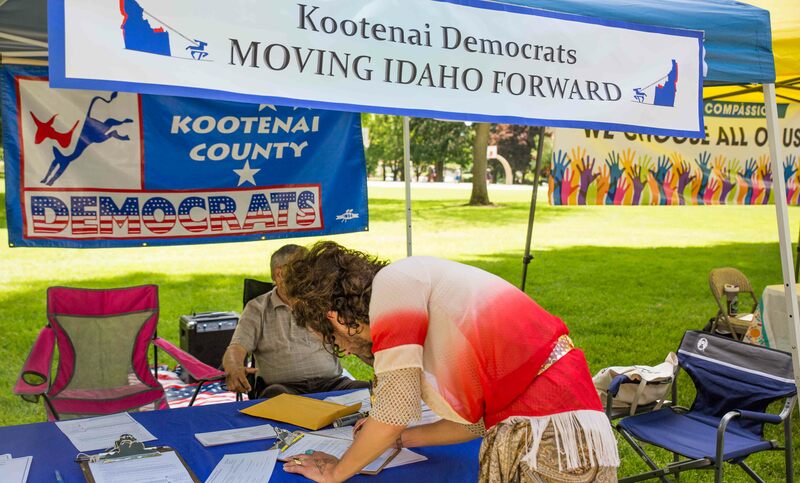 A total of 15 new voter registration and 27 Vote by Mail forms were completed during the three-hour event. Alongside the Kootenai County Democrats was the Campaign for Compassion booth, our allied group who will be joining us at the upcoming Fourth of July Parade on Sherman. 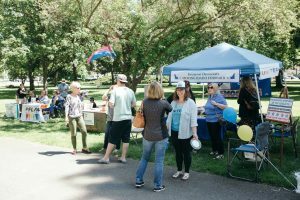 Their well-decorated booth engaged participants by having them write down responses to questions about times they experienced kindness from others and list other local, compassionate organizations. 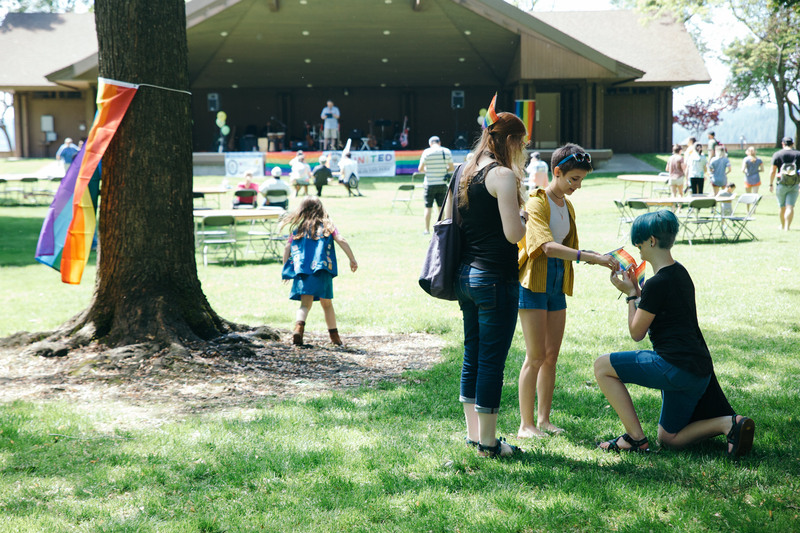 In support of the LGBTQ+ community and inclusion for all people, many organizations shared their mission, services, and educational materials. 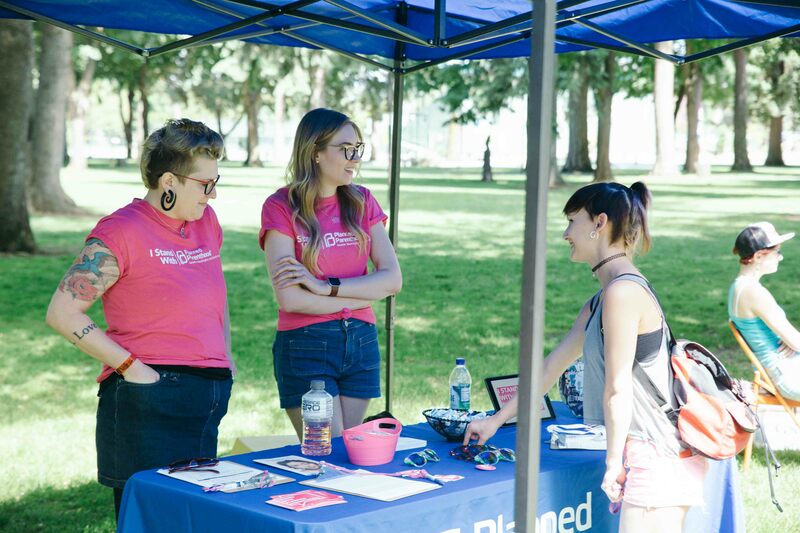 Some other vendors included: OutSpokane, Human Rights Education Institute, Heritage Health, Suicide Prevention Action Network, The Girl Scouts of Eastern Washington and North Idaho, PFLAG chapters of Spokane, Coeur d’Alene and Sandpoint, Monarch Mental Health Services, Bonner County Human Rights Task Force and our local Unitarian Universalists and Unity churches. Graphic buttons that support a multitude of causes with things like rainbow hearts and “Resist Idaho” were a common booth giveaway. Juli Stratton, the Executive Director for the North Idaho Pride Alliance, said every year the event gets better, larger and more meaningful for the community. She said valuable services were provided to the community during the family-friendly event such as HIV testing and foster child adoption. 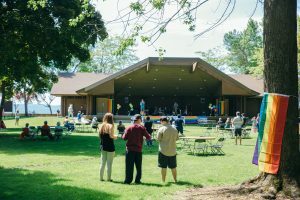 “What Pride in the Park does is bring our entire community together through our diversity and standing with one another,” Stratton said. 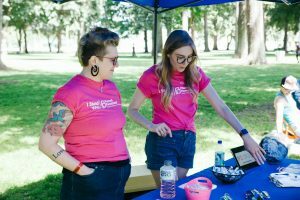 She said North Idaho Pride Alliance plans to join alongside the Kootenai County Democrats and other allied groups in the Campaign for Compassion on July 4th. 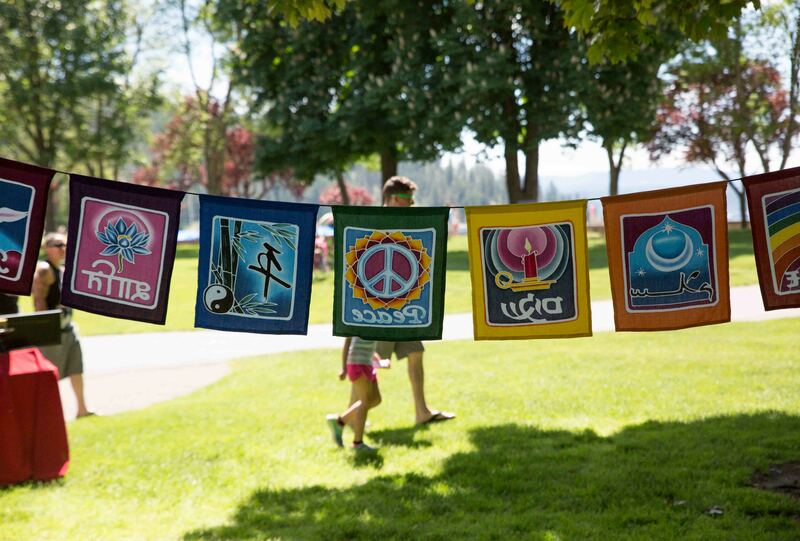 As a great summer kickoff, The Kootenai County Democrats were able to show their Pride in the Park. We look forward to joining the event next year with our ongoing commitment to support human rights, inclusion and compassion for all people. 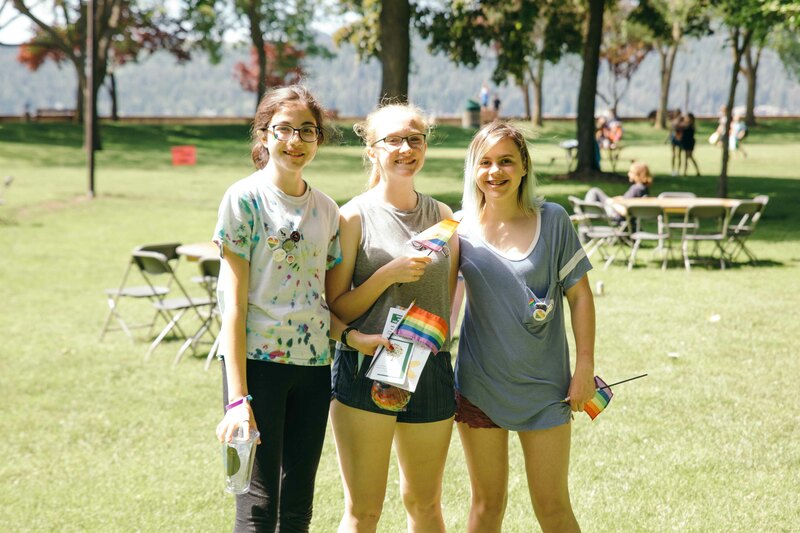 Good article and photos too–thank you!